This reclaimed cotton throw is stitched with illustrations and famed lines from "Alice in Wonderland." Get all wrapped up in Lewis Carroll's fantastic tale of whimsy, wonder, and utter jabberwocky with this charming throw stitched with imaginative illustrations and famed lines from the literary classic, "Alice in Wonderland." Made of pre-consumer cotton scraps that are shredded and then re-spun into new yarn. The finished material is made by knitting this cotton yarn with acrylic yarn for extra stretch (75% cotton, 25% acrylic). Made in Binghamton, New York. Machine wash in cool water, no bleach, dry on low heat setting. The quality of this throw is wonderful! Extremely happy with my purchase. Made my Granddaughter very happy! My granddaughter was very surprised and happy when she opened her blanket. She didn't expect to get it. She thanked me multiple times. She uses it every day. My friend absolutely adored this blanket1 she said it was cozy and comfortable. She also loved the saying on it. very pleased with product. glad to have found this site. 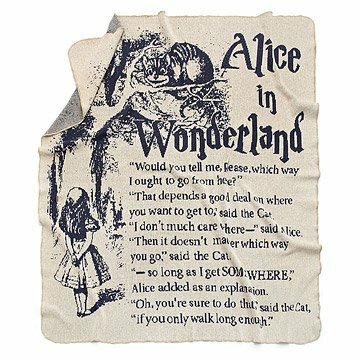 I LOVE Alice in Wonderland and was looking for a new throw for my sofa. The quality is not the best; also, it appeared that the print was black but it is dark blue. Gave this to my girlfriend as a Xmas gift. She loves it! Nice and cozy blanket with old school design and feel. I love the classic illustration style. Nice decorative blanket, though I wish it has nicer edging. There's nothing wrong with the existing edging, but it's rather plain. The blanket was a bit bigger than I thought it would be. Gave this blanket as a gift to my sister-in-law for the holidays. Her favorite story is Alice In Wonderland. She loved the blanket and was very happy to see it was made of Eco-friendly materials and in Binghamton, NY. Great for anybody who loves Alice in Wonderland!